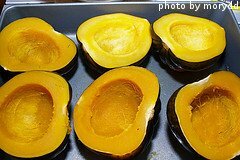 Acorn Squash Varieties - What's the Difference? 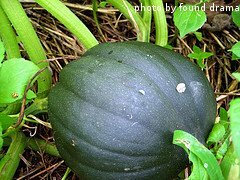 There are a few different acorn squash varieties available to the backyard vegetable gardener. Most varieties are similar in taste, texture and appearance. A typical acorn squash is dark green on the outside with golden colored flesh on the inside. The texture is slightly firm and buttery. Most varieties have a slightly sweet, nutty flavor. However, some acorn squash varieties are unique in appearance and flavor. We often get asked about which is our favorite variety of acorn squash. We have grown a couple over the years, but our favorite today is the Table King Bush, which is an heirloom variety. We like the fact that the plants are compact, and yet they still produce high yields - often 6+ squash per plant. The flavor is nutty and sweet and the texture is almost never stringy. 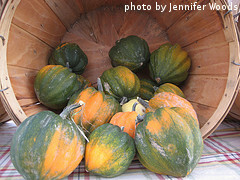 In addition, the squash are just a bit smaller, averaging 2 pounds each. This variety is ready in 85 days.